Our range of products include flexible containers, roller shutters, textile architecture, terrace blinds, awnings and tensile roofs. Flexible Containers make quick use and flexible handling possible. The special coatings, whether it is for temporarily storing oils and chemicals that are hazardous to the environment or for careful storage of selected foodstuff. 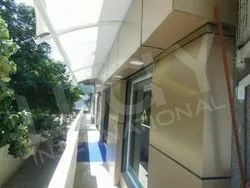 Roller Shutters (High Speed) used in industries. 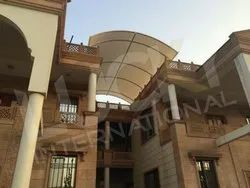 We are one of the leading Importers and suppliers of Textile Architecture. We obligated to meet the quality standards as per the customer demand. Available in a wide range of colours, they are suitable for all types of terraces, from the more traditional to the most contemporary designs. Micro-perforated fabrics allow the air to pass while protecting against the heat and allowing natural light into the home. They give a sensation of freedom, preserving the outside view. Waterproof fabrics offer total protection against UV, heat and bad weather. Influenced by current architectural and decorating trends, these fabrics combine technical performance with modernity. 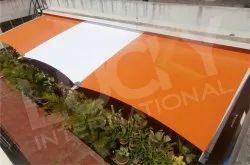 The Awnings fabric are known for their smooth, anti-dirt surface is treated, making them resistant to mould and easy to clean. They do not lose their shape and guaranteed resistance of the colours to the effects of UV ensures a long lasting attractive product. They are suitable for all residential and café/restaurant uses. Tensile Roofs enable the installation of tensile roofs on open structures for sports activities (stadiums, grandstand roofs, etc. ), cultural buildings (amphitheatres, etc.) and educational establishments (covered playgrounds for schools, etc.). They enable the creation of roofs or entire envelopes for closed buildings to optimise the transmission of natural light into atriums, shopping malls, sports halls and arenas, airport terminals and stations, etc. The light weight and flexibility of composite membranes enable the creation of shade structures in a wide variety of original shapes. They offer user comfort by protecting against bad weather and the heat of the sun. 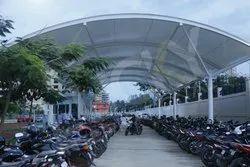 Tensioned structures are ideal for protecting goods (covered car parks, carports) and people (pedestrian walkway roofs, canopies, covered playgrounds, etc.). 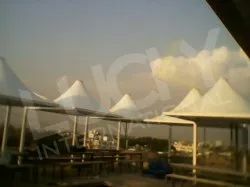 They are also suitable for covering open areas, such as open air sports grounds, play areas, covered halls, etc. international fire safety compliance for travelling structures. The Textile Architecture tent stands for mobility, immediate use as well as temporal and spatial independence. 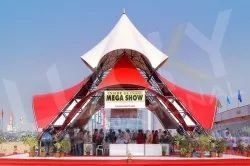 Events, fairs, presentations or just roofing and weather protection make tents an indispensable part of culture and lifestyle. These can be built in almost all dimensions and execution. The purposes for Large Event Tents as event tents or marquees are as diverse as the entire spectrum of cultural activities: from product presentation with VIP guests to the local shooting festival etc can be done. 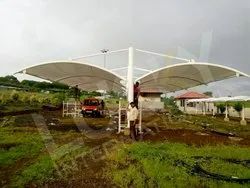 Lightweight Structures enjoy a long-standing reputation for their excellent weight/resistance/durability ratio, which ensures easy installation, long service life and no maintenance for both temporary and permanent installations. These fire-proof membranes are resistant to UV and mould and offer unrivalled dimensional stability. 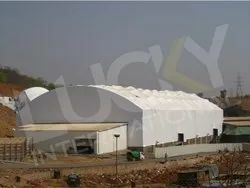 Lightweight Structures offer a solution that is quick to implement, extremely flexible and economical compared with a conventional construction for warehousing, storage buildings or hangars. Highly volatile and also explosive substances such as biogas can only be stored in containers that offer the maximum safety. 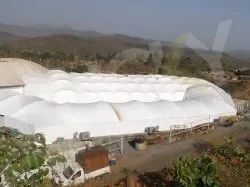 Biogas Containers are perfect for this application, thanks to the special fabric structure, and fulfil the high safety standards. Biogas storage systems are an active contribution to the generation of renewable energies and thus to environmental protection in general. There are high quality PVC Coated Fabrics which are specially produced for the efficient production of the Biogas. Fabrics are treated with suitable chemicals to be resistant to Fire, UV, Weather, Rot and Abrasion. It is made from special PVC formula which provides high endurance and protection against sun rays and extreme weather conditions. These fabrics are available in ranges from 900 GSM (Grams per Square Meter) till 1300 GSM. 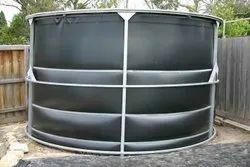 Few MAJOR reasons listed below, one should be using PVC Coated Fabrics (over HDPE, Rubber, other plastic fabrics / sheets) for their Biogas Structures. Biogas Cover Membranes selected for their durability and performance, a double-skin to contain the raw biogas and a second skin for climate protection. 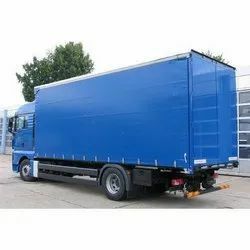 For protection against weather conditions, for covering goods, machines and plants this product range can be used as flat tarpaulins, tarpaulins or safety curtains. In the case of especially lightweight safety tarpaulins that are not used for rain protection. We make stringent efforts to continuously improve and upgrade our processing process and offer exclusive range of Oil Boom. 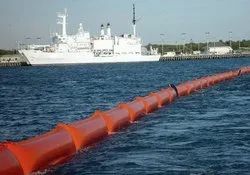 Our ranges of Oil Boom are precisely designed and sturdy in construction. Our offered products ranges are known for its corrosion resistance, dimensional accuracy, longer service life, reliability and sturdy construction. PVC Coated Crop Curtains by Sioen. Machines used in agriculture and in gardening and landscaping are equipped with crop curtains. It prevents the cuttings from being spread too far and effectively prevents stones or other foreign particles from being catapulted. Applications - shopping malls, residential projects, public buildings, hospitals, schools, car parks, etc. Easy to install for new-build and renovation projects.